Whether with a classical choir or a pop/jazz vocal group .. acappella music has always been close to my heart. For more than a decade I was a bass-baritone and I was only singing classical music. As a member of The Danish Radio Choir I have worked with such renowned conductors as Herbert Blomstedt, Gerd Albrecht and Gary Bertini. For many years I was singing in the vocal ensemble Musica Ficta. With this fine group of singers and its founder Bo Holten, I have had some of my most precious moments performing early and contemporary classical music. I particularly recall our concert tour in Australia as one of the best. Another was definitely a 2 week workshop with David Hykes (founder of "Harmonic Choir"), culminating in a concert of improvised music for a "full house" at The Glyptotek in Copenhagen. 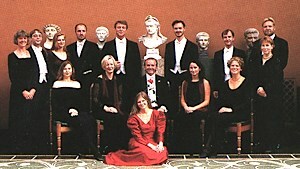 For the last 15 years I had the pleasure of being a singer in and the musical leader of the Copenhagen vocal group VoiceByChoice – consisting of classical as well as pop/jazz singers, some of whom are opera soloists, but all with extensive choir and vocal group experience. Quite a potent cocktail. As part of a Jubilee Concert for Big Band leader Harald Rueschenbaum I performed with a vocal group.. live acapella in Prinzregenten Theater in Munich with a filled room. There were truly some magical moments. Open Air Concert in Munich's "Brunnenhof"
I was singing Jazz tunes from the very beginning. Originally I started out with my own trio and as you can see in later years I've also been singing with various Bigbands ... among others with The Harald Rueschenbaum Bigband (Germany) and private concerts with Tivoli's Bigband in Copenhagen (Denmark). Here are two very "live" sound clips from a radio concert we did during Lange Nacht der Music in Bayerischer Rundfunk's Studio 1.